You’d be forgiven for mistaking this cascade of red for volcanic lava. 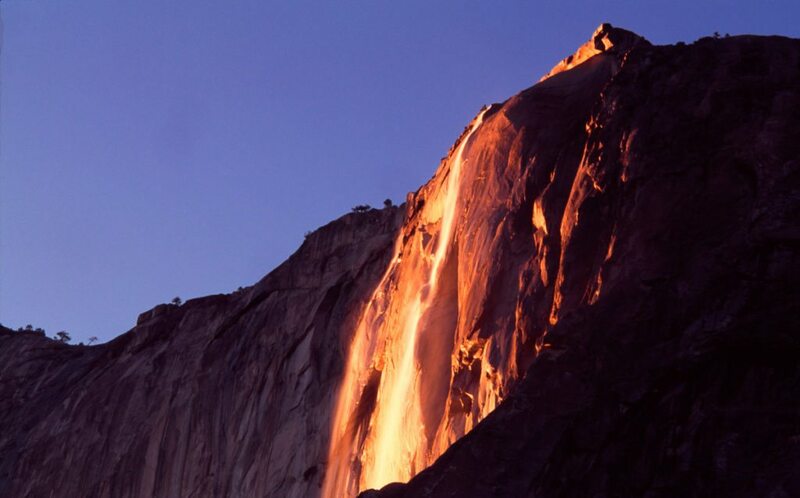 But it is actually the wet stuff – a waterfall transformed into a ‘firefall’, one of nature’s rarest phenomena. It’s a spectacle you might get the chance to see at the 300m Horsetail Fall in Yosemite National Park, California, on just a few days in February each year. When the conditions are right, the rays of the setting sun seem to set the stream of water ablaze, creating a luminescence lasting up to 10 minutes. But it doesn’t happen every year: the sky must be clear, there must be snow at the very top of El Capitan mountain (to feed the waterfall with snowmelt) – but the temperatures need to be warm enough for the water to be flowing. If it is too cold, it is raining, or the sky is overcast then the many photographers and spectators who gather here annually will go home disappointed. The first well-known colour photograph of the firefall was taken in 1973 by Galen Rowell. But it wasn’t until the dawn of digital cameras and photo-sharing sites like Instagram that this Yosemite firefall achieved worldwide fame.